So what is the origin of Thanksgiving? Why DO we celebrate this holiday? Something about Pilgrims and the Mayflower and a big feast, right? These Thanksgiving stories will remind you about the history and the meaning of Thanksgiving. Listen to, or read the story below to refresh your memory a bit and get to know some of the people who were at the very first Thanksgiving table. When you finish, dig a little deeper by researching some of the people in this story. If you're a teacher or a homeschooler, assign a person from the story to each child and have them write a short paragraph or report based on what they learned. After landing in Plymouth, the Pilgrims had to struggle to survive through their first wretched and miserable winter in Massachusetts. When spring and summer came it was a welcome relief. They learned so many things that first year. They had planted and cared for their first fields of corn. They had found wild strawberries in the meadows, raspberries on the hillsides, and wild grapes in the woods.In the forest just back of the village wild turkeys and deer were easily shot. In the shallow waters of the bay there was plenty of fish, clams, and lobsters.The summer had been warm, with a good deal of rain and much sunshine; and so when autumn came there was a fine crop of corn.They wanted to celebrate and give thanks to God for all he had provided for them. "Let us gather the fruits of our first labors and rejoice together," said Governor Bradford. "Yes," said Elder Brewster, "let us take a day upon which we may thank God for all our blessings, and invite our Indian friends who have been so kind to us." The great Indian chief, Massasoit, came with ninety of his bravest warriors, all dressed in deerskins, feathers, and foxtails, with their faces smeared with red, white, and yellow paint. Now there were only eleven buildings in the whole village, four log storehouses and seven little log houses; so the Indian guests ate and slept outside. This was no problem though, for it was one of those warm weeks in the season we call Indian summer. To supply meat for the occasion four men had already been sent out to hunt wild turkeys. They killed enough in one day to last the whole company almost a week.Massasoit helped the feast along by sending some of his best hunters into the woods. They killed five deer, which they gave to their paleface friends, that all might have enough to eat. 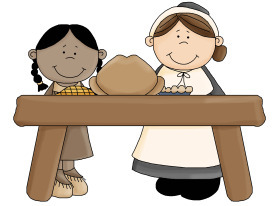 Under the trees were built long, simple tables on which were piled baked clams, broiled fish, roast turkey, and deer meat.The young Pilgrim women helped serve the food to the hungry Indians. One was Mary Chilton, who leaped from the boat at Plymouth Rock; the other was Mary Allerton. She lived for seventy-eight years after this first Thanksgiving, and of those who came over in the Mayflower she was the last to die. What a merry time everybody had during that week! Young John Howland was there. While they were sailing in mid ocean, he fell overboard but was quick enough to catch hold of a trailing rope. Perhaps after dinner he invited Elizabeth Tilley, whom he afterward married, to sail over to Clarke's Island and return by moonlight. With them, it may be, went John Alden and Priscilla Mullins, whose love story is so sweetly told by Longfellow. One proud mother, we may be sure, showed her bright-eyed boy, Peregrine White, who was the first baby born in Plymouth. And so the fun went on. In the daytime the young men ran races, played games, and had a shooting match. Every night the Indians sang and danced for their friends; and to make things still more lively they gave every now and then a shrill war whoop that made the woods echo in the still night air. The Indians had already learned to love and fear Captain Miles Standish. Some of them called him "Boiling Water" because he was easily made angry. Others called him "Captain Shrimp," on account of his small size. During this week of fun and frolic it was a wonder if young Jack Billington did not play some prank on the Indians. He was the boy who fired off his father's gun one day, close to a keg of gunpowder, in the crowded cabin of the Mayflower. After the third day, the Indian king and his warriors said farewell to their English friends and began their long tramp through the woods to their wigwams on Mount Hope Bay. On the last day of this Thanksgiving party the Pilgrims had a service of prayer and praise. Elder Brewster preached the first Thanksgiving sermon. After thanking God for all his goodness, he did not forget the many loved ones buried on the hillside. He spoke of noble John Carver, the first governor, who had died of worry and overwork. Nor was Rose Standish forgotten, the lovely young wife of Captain Miles Standish, whose death was caused by cold and lack of good food. And then there was gentle Dorothy, wife of Governor Bradford, who had fallen overboard from the Mayflower in Provincetown harbor. Did you learn anything about the origin of Thanksgiving?